This online course focuses on describing and managing your natural resources of soil, climate, water and vegetation. It also considers the people, finances and enterprises on the farm. A large range of climatic information produced by Queensland Department of Primary Industries. Comprehensive information on Australian weather and climate. Climate Kelpie is for Australian farmers and their advisors. 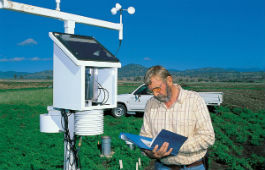 It connects you to tools and information about climate to help you make decisions about your farm business.